Earn up to 13,920 reward points. A durable workstation for creatives. 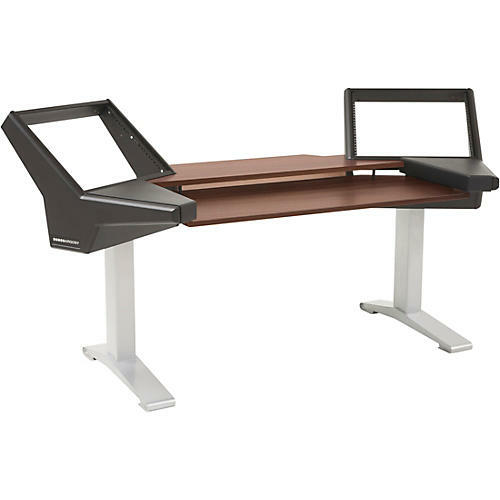 As important as your hardware and software is your work environment and with its beautiful mahogany hardwood veneer finish, The HALO desk is the ultimate in both ergonomics and aesthetics for any music industry professional. Selling your studio’s time is in part, well, sales. When a potential client checks out your studio see whether or not they want to produce their project in your facility, the Halo desk makes a silent but very loud argument in your favor. The Argosy HALO’s industrial design combines form and function into a robust, efficient and streamlined design for screen-based activities including video production, sound design, and editing. This version of the HALO is equipped with a keyboard shelf and is oriented toward the producer/engineer who controls a lot of virtual instruments. It is additionally equipped with two rack shelves and a set of Model 160 Speaker Platforms. Length: 79.7" - Depth: 33.5"